A busy end to the work week across the state thanks to a stationary front and a push of cold air lurking to the north. 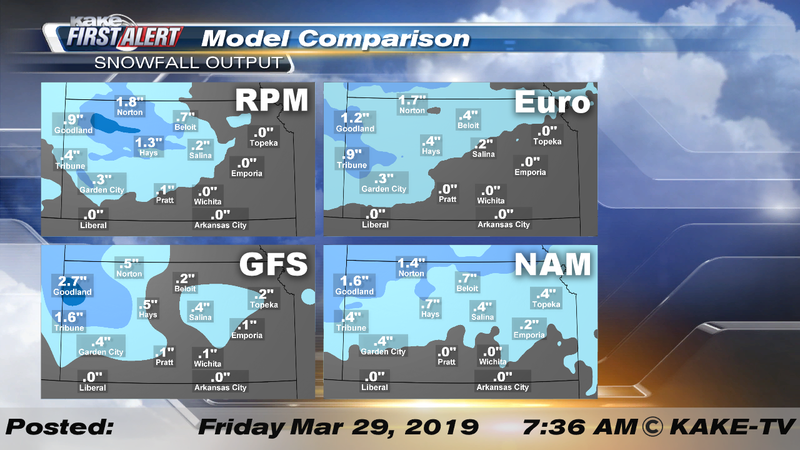 Scattered showers and storms are expected Friday across KAKEland and as temperatures plunge overnight, snow could even fall for some. Spotty showers and storms will dot the map Friday across much of KAKEland. High temperatures will be much cooler with highs in the 40s, 50s and 60s. The warmest temperatures will generally be located south and east of the Kansas Turnpike. In this relative “warm zone”, a few afternoon/evening storms could develop and they could be severe. The most likely threats with these storms will be large hail up to 1” and wind gusts that could top 60mph. At this time, the tornado threat looks extremely low across Southeast Kansas. These storms are expected to fire up in the mid to late afternoon and they will quickly track east out of KAKEland as we head into the overnight hours. While the severe weather threat will fade late Friday the scattered showers will continue across KAKEland as we head toward Saturday morning. As temperatures plunge, rain could change to snow starting in Northwest Kansas Friday evening. The rain-snow mix will spread southeast throughout the night giving just about all of KAKEland a chance at seeing the white stuff. South Central Kansas, including Wichita, could wake up to a light rain snow mix Saturday morning. While snow will be possible for all of KAKEland it is important to point out that accumulation will be very slim and in a lot of cases nonexistent. The best chance for accumulation will be along and north of Interstate 70. The majority of this accumulation will occur on elevated and “soft surfaces” like grass, decks and patio furniture. Major traffic issues are not anticipated thanks to relatively “warm” ground temperatures that will melt off the snow as it fall. Snow accumulation on the “soft surface” will likely melt off during the afternoon on Saturday thanks to above freezing highs and the return of sunshine. A reinforcing shot of cold air on Saturday will lead to a freeze Saturday night with lows dipping into the middle 20s state wide. Sensitive, outdoor plants should be covered Saturday night. We’ll keep you up to date with our Interactive Radar and LIVE weather coverage. Get those features and more on the free First Alert Weather App. With the app you can track storms in your area, stream the latest forecast videos and live severe weather coverage, and set customized alerts to keep you and your family informed and safe. Check Wichita road conditions at WichWay.org and check road conditions across the state at KanDrive.org.